I was looking forward to this. I snuggled up with it knowing I'd get a survivalist fix. 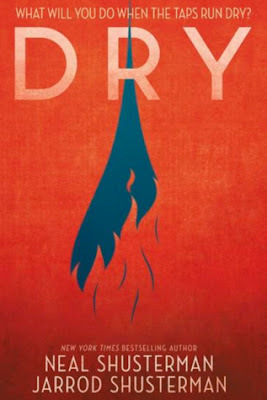 I haven't really met a survivalist book I didn't enjoy...and Dry was not to end this streak. I wouldn't say it blew all the others out of the water, but it smugly satisfied and definitely had its own edge. It's memorable. This doesn't rely on romance. It may help some of you lovelies to go in knowing. I wasn't disappointed by that at all. (Though I'd just enjoyed time with Lazlo and Sarai -- read my Muse of Nightmares review tomorrow -- so wasn't hankering hard). This is told from multiple perspectives and the voices are distinctly different. Win. This particular brand of disaster has a haunting and more resonating ring to it than most (though it's entertaining to imagine outrunning zombies / speculate what the moon being knocked out of its usual orbit might do to us....). Earlier this year, I sweat in L.A. heat while taking in the visible signs of forests recovering from fire. That memory made this pretty raw and plausible speculative fiction reading, for me. The prose is tight and well-edited. It's tasteful. Though there is some violence (including violence resulting in death) and somber insinuations, much is left to the imagination that might have been exploited. This one's for fans of Shusterman or Station Eleven, The Age of Miracles, Z for Zachariah and Life As We Knew It. Yes Dad, you'll enjoy this.